In the year since House Majority Whip Steve Scalise and others were shot at a congressional baseball practice, mass shootings have occurred across the U.S.
WASHINGTON — In the year since House Majority Whip Steve Scalise and others were shot at a congressional baseball practice, mass shootings have occurred at a Texas church, a Las Vegas music festival and high schools in Parkland, Florida, and Santa Fe, Texas. He said he'll be wearing a Capitol Police baseball cap in their honor Thursday night. 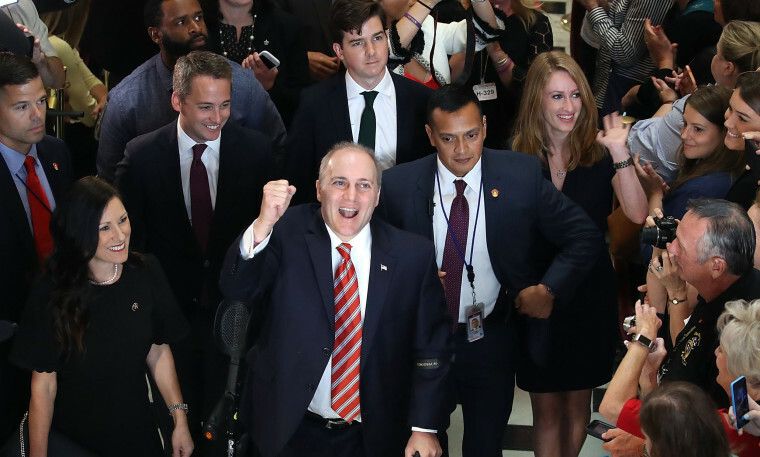 Meanwhile, Scalise, who has been walking with crutches or a cane, said that despite his physical limitations, he is starting at second base, which "tells you how bad the talent level is." "I can field balls and still make the throw at first," he told Fox News Channel. "Being able to walk out onto that field again on Thursday night with my uniform is going to be a special, special moment," he said.